How to build your first Machine Learning model on iPhone (Intro to Apple’s CoreML)? This article on how to build the first Machine Learning model on iPhone X was posted by Mohd Sanad Zaki Razvi. Sanad is currently pursuing B.Tech in Computer Science from National Institute of Engineering, Mysore. A data science rookie, he is passionate about Machine Learning, Data Visualization and the impact AI can have on the world. The Big techs are working on the “Technology of Future”. This is evident by the Launch of iPhone X which has created a buzz in the Machine Learning world. The data scientist in him is living a dream – he can see top tech companies coming out with products close to the area I work on. iPhone X comes with some really cool features like FaceID, Animoji, Augmented Reality out of box, which use the power of machine learning. The hacker in me wanted to get my hands dirty and figure out what it takes to build a system like that? Another important announcement was the introduction of CoreML (Apple’s official machine learning kit for developers) and an advanced processing chip A11 Bionic with a neural engine optimised for Machine Learning. Apple launched CoreML this year in their annual developer conference WWDC(which is equivalent of Google I/O conference) with a lot of hype. In order to better understand CoreML’s role, we have to know a bit of context. Accelerate and Basic Neural Network Subroutines (BNNS) – Efficiently utilize CPU for predictions using Convolutional Neural Networks. Metal Performance Shaders CNN (MPSCNN) – Efficiently utilize GPU for predictions using Convolutional Neural Networks. The point of difference was, one was optimized for CPU while the other was optimized for the GPU. The reason for this is sometimes during inference the CPU can be faster than the GPU. While during training almost every time GPU is faster. These multiple frameworks created a lot of confusion among developers and since they were quite close to the hardware(for high performance), they were difficult to program in. CoreML provides another layer of abstraction over the previous two libraries and gives an easy interface to achieve the same level of efficiency. Another benefit is that CoreML takes care of context switching between the CPU and GPU itself while your app is running. That is to say, for example, you have a memory heavy task that involves dealing with text (natural language processing), CoreML will automatically run it on the CPU whereas if you have compute heavy tasks like image classification, it will use the GPU. If you have both the functionalities in your app, it will also take care of that automatically so that you can get best of both the worlds. What else does CoreML provide? Vision: A library that provides high-performance image analysis and computer vision techniques to identify faces, detect features, and classify scenes in images and video. Foundation (NLP): As the name suggests it is a library that provides functionality natural language processing. Gameplay Kit: A library for game development also provides AI for the same, uses decision trees. Notice that the above design gives a nice modular structure to your iOS application. You have different layers for different tasks and you can make use of them in a variety of ways (for example, using NLP with image classification in your app). . Well, that was enough theory for now, it is time to get our hands dirty! Xcode 9 : This is the default software used to build apps for Apple devices. You can download it from here. In order to download Xcode you will have to login using your Apple ID first. Once you log in, you will have to verify your apple ID. You will receive the notification regarding the same on the device that is registered with your apple ID. Once you do this step, you will be shown a download option and you can download Xcode from there. Now that we have set up our system and all ready let’s move on to the implementation part! We will be looking at two important ways to utilize the power of CoreML by building them. Let’s start then! 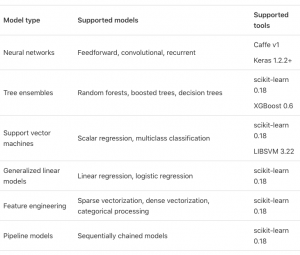 Now, one of the strengths of CoreML or rather should I say wise decision of its creators was to support conversion of trained machine learning models built in other popular frameworks like sklearn, caffe, xgboost etc. This didn’t alienate the data science community from trying out CoreML because they can experiment, train their models in their favourite environment and then simply import it to use in their iOS/MacOS app. In order to make the conversion process simple, Apple designed its own open format for representing cross framework machine learning models called mlmodel. This model file contains a description of the layers in your model, the inputs and outputs, the class labels, and any preprocessing that needs to be done on the data. It also contains all the learned parameters (the weights and biases). For this example, we will be building a spam message classifier in sklearn and then port the same model to CoreML. The SMS Spam Collection v.1 is a public set of SMS labeled messages that have been collected for mobile phone spam research. It has one collection composed by 5,574 English, real and non-encoded messages, tagged according to being legitimate (ham) or spam. We first import the coremltools package in python. Then we use one of the converters to convert our model, in this case, we used converters.sklearn because we have to convert a model built in sklearn. We then pass the model object, input variable name, and the output variable name in .convert(). We then set the parameters of the model to add more info about the inputs, outputs and finally call .save() to save our model file. When you double click on the model file, it should open in a Xcode window. As you can see, the model file shows details about the type of model, its inputs, and outputs, their types etc. I have highlighted all this information in the above figure. You can match the description with the ones we provided while converting to .mlmodel. That is how easy it is to import your model into CoreML. Now your model is into Apple ecosystem, that’s when the real fun starts! Now that we have trained our model and ported it to CoreML, let us use that model and build a spam classifier app for iPhone! The play button on the top left is used to start the app on the simulator. Just below the play button are the files and folders related to our project displayed. This is called the project navigator it helps you navigate between files and folder of your project. Let’s first run our app and see what happens. Click on the play button on the top left that will run our app in the simulator. Try typing some text in the box and clicking on the Predict button. What happens? For now, our app doesn’t do much it just prints whatever has been typed in the box. Drag your .mlmodel file into the Xcode window in the project navigator pane. When you do that, a window will pop up with some options let the default options be and click “Finish”. When you drag a file like this into Xcode, it automatically creates references to the file in the project. This way you can easily access that file in your code. This will open project settings on the right-hand side. Click on Compile Sources and select the + icon. In the window that appears select the SpamMessageClassifier.mlmodel file and click Add. Now every time we run our app, Xcode will compile our machine learning model so that it can be used for making predictions. Any application that is to be developed for an Apple device is programmed in swift. In the project navigator pane select ViewController.swift. This is the file that contains much of the code of that controls the functionality of our app. The above code checks whether the user has entered any message in the text box. If he has, it calculates the tfidf of the text by calling a function tfidf(). It then creates an object of our SpamMessageClassifier and then calls the .prediction() function. This is equivalent of .predict() in sklearn. It then displays an appropriate message based on the prediction. But why is tfidf() required? The above code finds the tfidf representation of the message entered in the text box for that it reads the original dataset file SMSSpamCollection.txt and returns the same. Once you save the program and re-run the simulator, your app should be working fine now. Optimized for on-device performance, which minimizes memory footprint and power consumption. On-device means privacy of user data, you no longer need to send data to your servers to make predictions. On-Device means functional predictions even without an internet connection and a less response time to the user. It decides for itself whether to run the model on the CPU or the GPU (or both). Because it can use CPU, you can run it on the iOS simulator (which doesn’t support GPU). Native support for Supervised models only doesn’t have support for unsupervised or reinforcement learning. No training on the device, only inference(prediction). If CoreML does not support a certain layer type, you can’t use it. Currently impossible to extend Core ML with your own layer types. You cannot look at the output produced by intermediate layers, you only get the prediction. In this article, we learned more about CoreML and its application in building a machine learning app for iPhone. CoreML is a relatively new library and hence has its own share of pros and cons. A very useful feature provided here is it runs on the device locally thus giving more speed and providing data privacy. At the same time, it can’t be thought of as a full-fledged data scientist friendly library yet. We will have to wait and see how does it evolve in the coming releases. For those of you who got stuck at some step, all of the code for this article is available on GitHub.